It seems that Mars is turning out to have been a nearly identical planet to Earth in its distant history. There is liquid water on Mars; the planet had vas oceans in the past, and now we knwo the red planet had abundant oxygen in the distant past. A new finding by NASA’s Curiosity has provided evidence of significant amounts of oxygen that once permeated the Martian atmosphere. Apparently, the Red Planet was more Earth-like than many scientists thought until now. In fact, it is highly possible that organisms that thrive on Earth could have thrived on Mars in the distant past. This second one is still debatable. Using the ChemCam instrument aboard Curiosity, scientists at the Los Alamos National Laboratory have discovered high levels of manganese oxides in cracks filled with minerals present in some Martian rocks of the Kimberley region in the Gale crater. The presence of this chemical suggests that in the past there were sufficient levels of oxygen in the atmosphere of Mars, which would have made the planet “breathable” for humans. This finding is yet another important discovery which suggests that the red planet was once very Earth-like. While researchers are still not sure about microbes, finding traces of oxygen in Mars’ atmosphere is a very important discovery that will help us understand our neighbouring planet which in addition will help plan future trips to the red planet. “These high manganese materials can’t form without lots of liquid water and strongly oxidizing conditions. Here on Earth, we had lots of water but no widespread deposits of manganese oxides until after the oxygen levels in our atmosphere rose,” said Lanza. This scene shows NASA’s Curiosity Mars rover at a location called “Windjana,” where the rover found rocks containing manganese-oxide minerals, which require abundant water and strongly oxidizing conditions to form. In front of the rover are two holes from the rover’s sample-collection drill and several dark-toned features that have been cleared of dust (see inset images). These flat features are erosion-resistant fracture fills containing manganese oxides. The discovery of these materials suggests the Martian atmosphere might once have contained higher abundances of free oxygen than it does now. According to experts, in Earths geological history, the appearance of high amounts of manganese oxide minerals is in important clue which indicates a major change in our atmosphere composition: from low oxygen abundances to the oxygen-rich atmosphere we have today. 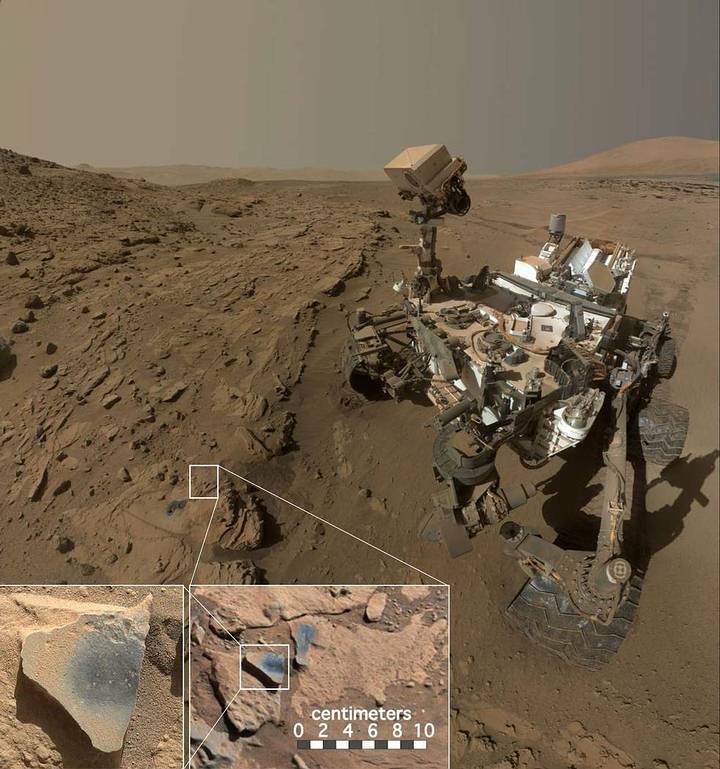 The discovery of the same materials on the red planet indicates that oxygen levels rose there too, before falling to the present values the Curiosity rover has seen. Experts indicate that without a protective magnetic field shielding the surface of the red planet, ionizing radiation began splitting water molecules into hydrogen and oxygen. Mars as we know is a planet with a relatively low gravity which means that the planet was not able to hold onto light hydrogen atoms. However, the heavier oxygen atoms remained on the planet. Researchers speculate that much of the oxygen ended up in Mars geological formations which eventually lead to the rusty red dust that covers the surface of Mars today. According to scientists, the red iron oxides on Mars need only a mildly oxidizing environment to form, while manganese oxides require a strongly oxidizing environment, which is more than previously known on Mars. Abundant atmospheric oxygen has been treated as a so-called biosignature or a sign of extant life but this process does not require life.